Two Additional Cardinal Scale Pit-Mounted EPR Truck Scales Provide Terminal the Ability to Weigh Greater Volumes of Freight. Major ocean transport company adds more Cardinal EPR truck scales and 210 indicators to expedite traffic flow for 600 truck weighments per day at busy Port of Miami. Traffic congestion was becoming a major issue at the Port of Miami with a steady increase in export freight volumes over the last several years and the completion of a new underground truck tunnel leading into the port. A lengthy line of trucks were typically waiting to be weighed before entering the freight terminals at the port. It became apparent that a solution was needed to be able to move this increased traffic through the port more quickly and efficiently. One of the largest ocean transport companies at the Port of Miami rearranged their container yard and came to Cardinal Scale seeking a solution for its truck scale needs. Cardinal Scale had several meetings with Port of Miami officials and the ocean transport company’s personnel during which various yard and scale layouts were considered, including above or below ground scales, steel or concrete decks, network connectivity, and weight documentation. It was ultimately decided that there would be two new inbound steel deck truck scales installed below grade in deep pits. The deep pit request presented an important challenge: How to ensure that a 4 1/2 foot deep pit would remain dry at just above sea level on an island? Cardinal Scale had stressed the importance of keeping the pit dry during the design process. The ocean transport company decided to purchase two new 13570-EPR truck scales from Cardinal Scale, which were slightly modified to be installed in the pits. The pit design was chosen to save yard space, as well as, producing an easier and safer method for drivers and other personnel to move in and around the trucks. A steel deck was chosen over a concrete deck to avoid delays associated with the curing time of a concrete deck. The scales were connected to Cardinal Scale model 210 weight indicators fitted with 10/100 Ethernet cards and attached to P500 receipt printers, which were installed in two separate scale houses. The Ethernet cards allow them to communicate the weight data to their remote server and the ticket printers allow them to produce a hard copy for the truck drivers, which not only includes their truck ID, but the time and date of weighment as well. The ocean transport company’s freight terminal at the Port of Miami operates 24/7, 365 days a year. 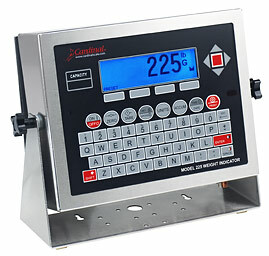 It can now weigh more than 600 trucks per day with the addition of the two pit-mounted Cardinal truck scales. The ocean transport company has substantially reduced the weigh-in time for each truck, which in turn allows them to load the freight containers on the cargo ships more efficiently. The additional truck weighing scales have led to shorter lines of trucks, thus improving the overall traffic congestion at the Port of Miami as well. You can read more about the case study by clicking the link. What Type Of Scale Should A Metal Recycler Buy? Another popular question we are asked is: How many types of 70 foot truck scales exist (low-profile, pit style, full electronic, concrete deck, steel deck)? Is there one particular type you would recommend over another for use within the recycling business? What benefit does it present to pick one over the other? 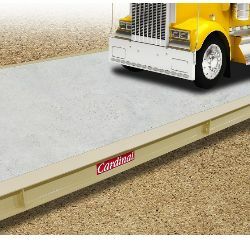 Truck scales come in numerous sizes and types. Truck scales could be portable axle, weigh-in-motion, self-contained transportable, electro-mechanical, electronic, and hydraulic versions. In a traditional truck scale you would need to choose either an above ground or pit style scale. Then, a painted steel deck or concrete deck that you would pour on location. For the recycling business, generally the most effective choice will be the steel deck electronic truck scale because it provides the fastest setting up time and if you’re replacing an existing scale, the lowest down-time in swapping out a pre-existing truck scale. If the metal recycling company is replacing an older truck scale installed inside a pit that is experiencing water damage concerns, a hydraulic truck scale could be a good decision to think about for an advancement. The load cells within a hydraulic truck scale have excellent defense to water and lightning issues. As with any big decision like this, we recommend that you contact your local scale company to provide you with a recommendation and truck scale price quote. It could be that your best choice might be a pit style scale. Or maybe a hydraulic scale would work best for you. A local scale dealer should be able to provide that recommendation to you and present you with several buying options to consider. understands that pit-type installations often involve replacing an existing mechanical or electronic scale. With a 42-inch profile, (pier to top of approach) the PT easily fits into many existing pit-type foundations. Standard widths for the PT Series concrete or steel deck models range from 10 to 14 feet, NTEP Certified. The staff of engineers specializes in custom-built models, including multi-platform scales that conform to the exact requirements of your existing pit. All of this equates to a quicker installation and less disruption to your business.